we manufacture high quality of Centricleaner cones & body for News print paper mills . we manufacture centricleaner cones as per drawings / samples. We are a recognized entity, engaged in providing the best-in-class range of Ceramic Lined Cone for our clients. Ceramic cones deeply embedded in Epoxy Compound giving Resilient, Flexible base to fit plain as well as curved surfaces. Designed for abrasion resistance to protect bins, buckets, chutes and hoppers in bulk material handling. 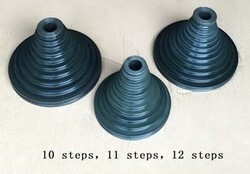 General Description:-Scot- Ceramic Tap out Cones are used to cover and protect taphole plugs used in furnaces for melting aluminum, magnesium and zinc alloys. We are engaged in manufacturing and exporting a wide range of ceramic cones. We provide a wide range of Ceramic Cones to our customer. We are engaged in manufacturing a wide range of ceramic cones.